Like all true artists, Carel has a temperament which he sometimes has difficulty in controlling. 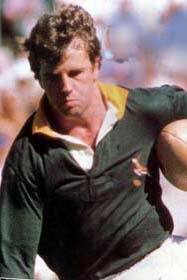 His rugby started at Paarl Boys High and in the late 1970's he played in Craven Week as a stand-off half. It so happened that when he came to Stellenbosch he played at centre. We only found out after we had selected him at centre that he actually preferred the wing position. There was a bit of a squabble about all this and we subsequently dropped him altogether. Later when we felt he had had his punishment we selected him on the wing and he was soon in the Western Province team. Absolute brilliance was his once he felt happy in his position. He never looked back. He was right and I was wrong. He has gone on to score some of the greatest tries ever from the wing position and has represented his country with courage and distinction.